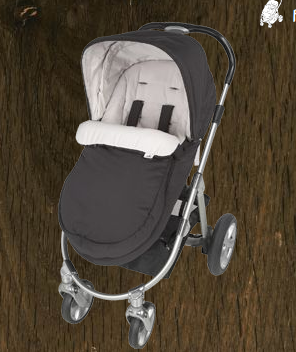 Because I am bored with my current stroller, I find myself searching online gear sites for a new option. The Mama and Papas Ziko Herbie, which will be available soon, caught my eye because of it’s sleek exterior and elegant appearance. It is offered in 3 colours: navy, black and a ‘celery’ green. The interior is accented beautifully with a choice of moderns pattern that resemble chic nursery linens. 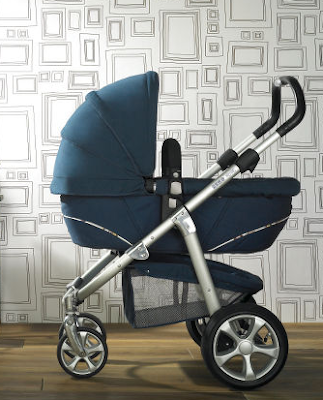 Like many of the strollers that are currently hitting the market, the Herbie’s carrycot converts to a toddler seat. It is also suitable for overnight sleeping with the separate Mamas & Papas moses basket mattress and carrycot stand for added convenience on trips. 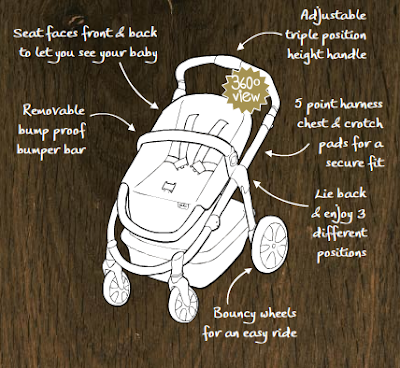 – Carrycot and pushchair can face parent or face outwards – it’s up to you! Includes: light weight aluminium chassis, carrycot, pushchair, footmuff / liner, bag, parasol, raincover and a pump for the tires All buggies and strollers are covered by our 2 year commitment. 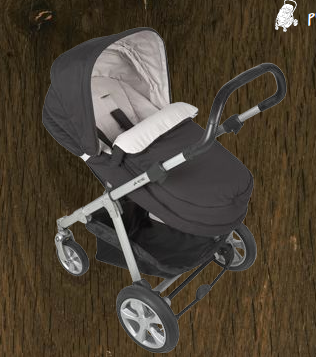 This stroller is a bit of a splurge at $480£ (approx. $1000US), without the infant carseat. It does however, include many accessories that are not usually included and is designed to accommodate a growing baby, reducing the need to purchase add ons in the future. Do not purchase the Mamas and Papas Herbie! As a new mum of a 7 week old baby I can honestly say I have never experienced such a badly designed stroller/pram. To connect and disconnect the car seat to the wheels you must be a weight lifter, and to even lift the car seat with the baby inside is an impossible task. The handles on the pram have a mind of their own and don’t even try to use the shopping basket underneath as you won’t be able to without lifting the whole carrycot off each time. In short a total waste of money. When I took this back to the shop and complained that it was too heavy to lift in and out of car and onto wheel frame (car seat meant to last until baby one year!!?? A total joke) I was told as there is nothing wrong with it I can’t. So if you want to purchase this stroller I suggest you try carrying the car seat with the weight equivalent of a 2 month baby in it and see that you can first. The designers obviously have never given birth as you ache enough after that without added pressure! Am truly disgusted with mamas and papas and will never shop there again. As a new father I have had the herbie for two months and think its spot on. It is easy to push and manovers well, come with all attachments required and has a good size storage basket which alot of competitors don’t. With regards to the car seat we lifted it up in the shop before purchase realised that it is heavy and didn’t buy it!! There are plenty of other options with car seats so try one of those. i am now on my 3rd hernie not through fault ordislike, i simply love the pramand think its the best money iv spent!! its such a fantastic design from new born to toddler, its such a fab spacious seat unit my 19 month old still looks at home in this pram, i loved it somuch i have purchased 3 as i liked differant colours!! !mad i know! true it does have its faults the fading of the material, height adjustable handle doesnt last long before it goes on the blink and the lack of thought that went into the folding of the pram as this is without a doubt going to scratch the front immediatly!! but these aside it still hasnt put me off the pram!! so go on spoil yourself and your little one buy it now! Never buy one of these. Ours has been trouble from start to finish, not only the design issues, but almost every moving part has broken. This reached a new low when the pram collapsed last week whilst crossing the road. Its been back several times for repair but now is quite frankly dangerous, and M&P literally couldn’t care less. Eventually they gave us a new one which has the same problems, its now with trading standards. i have the herbie and pro sleep and hae to say its looks the best out of all the prams but i cannot get the pro sleep car seat off the herbie frame, neither can anyone,not een my partner, it need two of you, so thats rubbish. i could not use for a while as my son was long and grew out the carrycot and too big for the pram so had to buy another one. and now im looking for a easy travel system so that i can go out alone as my son is only 13 weeks, so disapointed with the pram for that reason. pushes nice, looks good but would i buy again NO, pro sleep great but wont last much longer as very small. jus brought a herbie had no instrusctions with it but can u take all covers off and machine wash them?